On June 12, 2016, 49 lives were lost on Latinx night at Pulse nightclub in Orlando, Florida when gunman Omar Mateen targeted LGBT club-goers out for a night of dancing. Now, the city and a private foundation are making steps toward honoring them in a public memorial. This Monday, plans for an interim memorial were approved at Orlando’s town hall meeting. The plans are spearheaded by the onePULSE Foundation, a nonprofit incorporated by the owners of Pulse to honor the victims of the shooting and provide support to survivors and the families of the deceased. The Foundation has created a fund to support scholarships in each of the victims’ names. They are also planning a museum that will showcase the narratives of those affected as well as a permanent memorial for the site. The temporary memorial is meant to make the site more welcoming while the Foundation develops the permanent memorial. 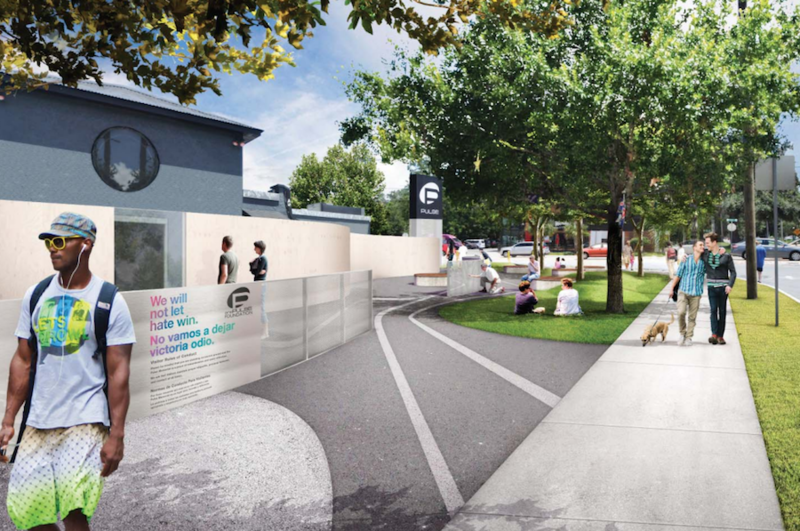 The approved measures include a rainbow-painted crosswalk, illuminated benches, a new fence painted with murals, landscaping features on the otherwise concrete curbside, and areas for reflection and walking around the site, which has been closed off to the public for over a year now. The City has already completed the crosswalk painting portion of the memorial on Esther Street leading up to the nightclub, much like the rainbow flag being permanently installed today in front of New York’s Stonewall National Monument as an homage to early LGBT and HIV/AIDS activists. Both installations have been timed to coincide with National Coming Out Day, held yearly on October 11. Orlando Mayor Buddy Dyer praised the plan for the temporary memorial, which he said would be “much more friendly … to the public that are coming there.” Since the shooting, the site has attracted visitors from around the world who pay their respects to the souls lost that night, leaving behind flowers, balloons, photographs, advocacy posters, and other personal tributes. At the Orlando town hall meeting, a panel of experts also discussed the site’s eventual fate. One panelist, the vice president of New York’s National September 11th Memorial, argued that some or all of the original structure should be kept intact rather than demolished, preserving the survivors’ and families’ connection to the space where their loved ones experienced their last moments.